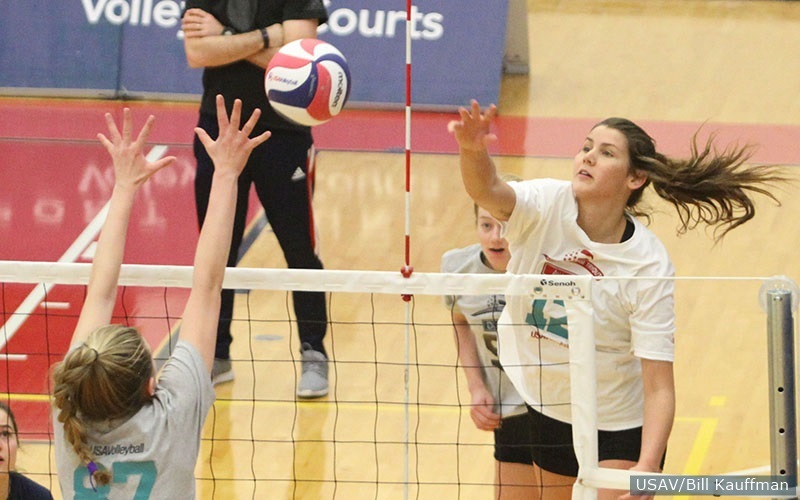 COLORADO SPRINGS, Colorado, 2 de abril de 2019 - Voleibol de EEUU se enorgullece en anunciar su plantel de 28 jugadores su Equipo Nacional Colegial de Mujeres de EEUU – Roster de Anaheim compuesto por las actuales jugadoras. Las acomodadoras nombradas al CNT-Anaheim son Teana Adams-Kaonohi (Universidad Estatal de Kansas, Honolulu, Hawai), Madelyn Cole (Universidad de Creighton, Dallas, Texas), Meghan Donovan (Universidad de Georgia, St. Louis, Missouri) y Ella Powell (Universidad de Washington, Fayetteville, Arkansas). Los liberos son Hana Lishman (Pepperdine University, Kailua, Hawaii), Kelsey Miller (University of Virginia, Crestwood, Kentucky), Emma Smith (California-Berkeley, Manhattan Beach, California) y Rachel Whipple (University of Colorado, Centennial, Colorado) . Las cuatro opuestas seleccionadas son Melissa Evans (Universidad Estatal de Carolina del Norte, Lone Tree, Colorado), Bailee Huizenga (California-Berkeley, Temecula, California), Brooke Kanas (Texas Tech, New Braunfels, Texas) y Gloria Mutiri (Kansas State University, Sand Springs, Oklahoma). Las Centrales seleccionadas para el escuadrón de élite CNT-Anaheim son Preslie Anderson (California-Berkeley, Chandler, Arizona), Lauren Forte (California-Berkeley, Tempe, Arizona), Jasmine Gross (Universidad del Sur de California, Portland, Oregon), Blake Mohler ( Universidad de Purdue, Ocean Springs, Mississippi), Tyanna Omazic (Universidad de Missouri, Kansas City, Missouri), Regan Pittman (Universidad de Minnesota, Spring Hill, Kansas), Lauren Sanders (Universidad de Washington, Snohomish, Washington) y M'Kaela Blanco (James Madison University, Riverdale, Maryland). Las atacantes externas nombradas en la lista son Brynn Carlson (Kansas State University (Woodbury, Minnesota), Samantha Drechsel (University of Washington, Woodinville, Washington), Keeley Davis (Creighton University, Highlands Ranch, Colorado), Anna Dixon (Kansas State University , Louisburg, Kansas), Kayla Lund (Universidad de Pittsburgh, Pasadena, California), elan McCall (TCU, Leander, Texas), Valerie Valerian (Universidad del Norte de Texas, Sugar Land, Texas) y Roxanne Wiblin (Universidad de San Diego, Berkeley, California).